The government has announced an increase in payroll taxes for investment in the National Health Service. But, in a move seen as softening the blow of overall levy increases totalling �6.1bn, fresh tax credits for families have also been announced. Chancellor Gordon Brown, in his Budget speech, raised by one percentage point the proportion of wages UK workers will lose to national insurance. He also froze at �4,615 the level at which workers start paying income tax and national insurance, rather than raising it in line with inflation. The moves will add an extra �3.70 week to the state's take from a full-time worker on �21,700 a year, Mr Brown said. In a surprise announcement, he also applied the rise to the national insurance bills paid by employers, an increase which, because they are not protected by a contributions ceiling, could add millions of pounds to payroll costs. "I believe it is right that when everyone - employees and employers - benefit from the insurance provided by the National Health Service, everyone who can should make a fair contribution," Mr Brown told MPs. Employers would contribute a "similar amount per employee", he said, without specifying the change further. But the chancellor said that, thanks to extra �2.5bn directed at families, even when the national insurance rise was taken into account, couples with children would be better off. A child tax credit would be available to families with combined incomes of up to �58,000, with those earning up to �66,000 given some help for the first year of their child's life. Families with overall income of �50,000 or less would gain �1,400 a year in tax credit and child benefit. This sum compared with �575 a year in 1997, Mr Brown said. Families with two children on �35,000 a year could receive childcare help of up to �50 a week. "Our changes will mean that, from next April, mothers who wish to leave work and be with their children at home but have found it financially difficult to do so will find it easier," Mr Brown said. Poorer families would also be helped such that a couple of children will have a minimum income of �237 for a full working week. Taken together with the national insurance reforms, changes to family taxation meant that "half Britain's families with children will be better off as a result of the tax and benefit changes in the Budget", the chancellor added. 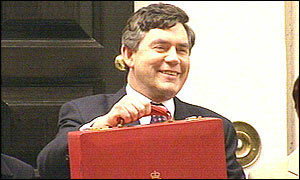 Mr Brown also avoided angering motorists by maintaining petrol duty and vehicle taxes at current levels. "Given the high and volatile oil price I have decided to freeze fuel duties this year," he said. He also froze alcohol duties, which, being higher than those in many neighbouring countries, have been blamed for encouraging smuggling into the UK. And Mr Brown halved duty on ales produced by small brewers, a cut equivalent to 14p per pint, to be implemented "in time for the [football] World Cup". But tax on a packet of 20 cigarettes was raised by 6p "for public health reasons". "Ninety six per cent of estates will pay no tax," he said. Budget measures were welcomed by groups including the National Childminding Association, which said the family tax reforms "recognised the pressures on working families and the need to give all children a decent start in life". "[The Budget will certainly help many children in poorer families and reflects the needs of many working parents," chief executive Gill Haynes said. But the Tobacco Manufacturers' Association warned that the extra cigarette duty represented a "lost opportunity to tackle Britain's massive smuggling problem". "If tobacco tax continues to rise at this rate, smuggling is predicted to rise from the current level of 21 per cent of the market to around a quarter of cigarette consumption by 2004/5," chief executive Tim Lord said. And the Confederation of British Industry warned there would be "deep dismay" at extra business taxes such as the national insurance increase. "We are worried that he is now imposing a business tax burden that impacts directly on the cost of employing people at a time when UK competitiveness is being put to the test," director general Digby Jones said.